From left: Rosalind Franklin, trustee; Frank H. Mynard, board chair; Ronald Kaplan, executive vice president for research; Dr. K. Michael Welch, president and CEO; and Leon Rockingham Jr., mayor of North Chicago. 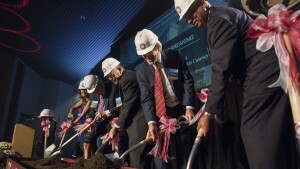 Rosalind Franklin University of Medicine and Science celebrated the impending construction of its new Innovation and Research Park with a ceremonial groundbreaking on Sept. 8 attended by state and local officials, life science industry partners, and university faculty, alumni and supporters. The research park, which will be built on the university’s campus in Lake County, home to the largest concentration of bioscience companies in the Midwest, will offer a collaborative environment for academic and industry scientists, innovators and entrepreneurs, with the goal of accelerating RFU’s nationally recognized research into treatment and prevention of disease. It will provide state-of-the-art laboratories and spaces for faculty and commercial startups and small- to mid-size national and international biotech firms. RFU investigators conduct biomedical research in 12 major areas, including cardiac resuscitation, cancer, drug discovery and development, cystic fibrosis, neuroscience and neurodegenerative diseases such as Alzheimer’s and Parkinson’s. 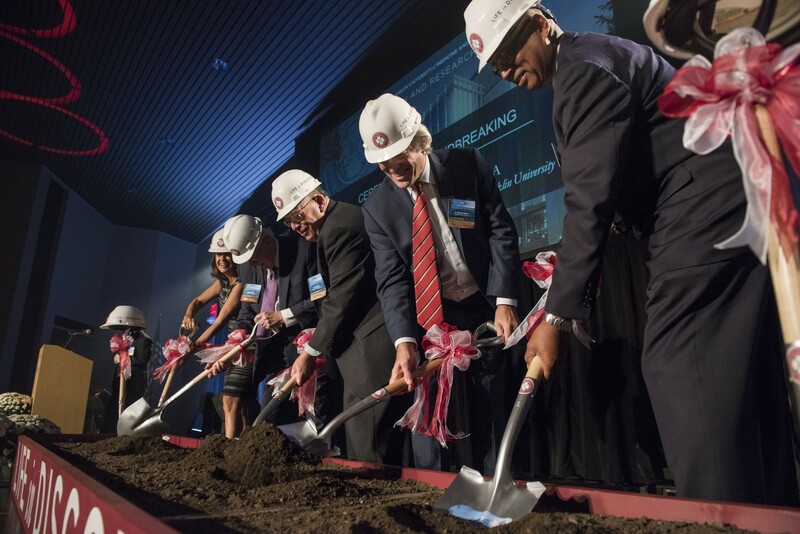 The expansion will consist of 100,000 square feet of state-of-the-art research, office and meeting space that will ultimately house 175 scientists, including investigators in industries collaborating with the university, which will occupy approximately two-thirds of the building. Remaining space will be leased to life science companies. Job creation, job training programs and internships are also components of the vision for the park, which is expected to generate an estimated 500 direct new jobs. A study by Lake County Partners forecasts a total economic regional impact of $117 million per year. 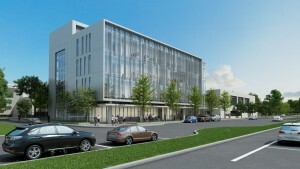 “Lake County is already a favored location for life science activity and jobs and the development of the new Rosalind Franklin University science park will further enhance our cluster and create additional space for international life science companies to land in Illinois,” said Kevin Considine, Lake County Partners president and CEO. The $50 million construction will be financed through a recent bond sale that generated in excess of $1 billion in interest, according to the Atlanta-based developer for the project, The University Financing Foundation (TUFF). Terms of the funding agreement also include a beneficial refinancing of existing debt and a long-term ground lease and master lease. TUFF has extensive experience in building science parks throughout the United States and assisting universities in financing and expanding their infrastructure. RFU is working with the SmartHealth Activator, a Lake County-based incubator focused on the commercialization of biotechnology coming out of Midwest universities, to increase the number of new companies formed by RFU faculty entrepreneurs. The science park is based in a public-private partnership that, in addition to RFU and TUFF, includes the City of North Chicago, Lake County, and the Illinois Department of Commerce and Economic Opportunity. Completion of the new building is expected in summer 2019.